I am pleased to be the lead speaker in Landmarks Association of St. Louis’ fall “Mid-Century Modern Masters” lecture series. The series also includes lectures by Toby Weiss, Esley Hamilton, Andrew Raimist, Eric Mumford, Gene Mackey and Mary Brunstrom; details are online here. — M.R.A. 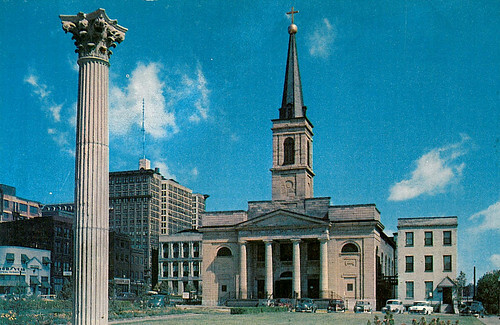 Postcard view from the late 1950s shows the Old Cathedral (with adjacent rectory intact) and one of the columns of the demolished United States Custom House. Sunday, September 12 at 3:00 p.m.
Michael R. Allen, Director of Preservation Research Office and writer of the popular blog Ecology of Absence will be speaking on the forces that provided the impetus for the preservation movement in St. Louis. The clearance of 40 blocks of St. Louis’ riverfront for the modern masterpiece Jefferson National Expansion Memorial remains an unprecedented architectural loss for the city. However, the memorial project and contemporary clearance for highways and housing projects provided the impetus for launching the St. Louis preservation movement that endures today. Amid clearance, early voices for preservation called for saving some of the riverfront and, when battles were lost, turned attention toward other downtown buildings and historic neighborhoods. Even Eero Saarinen, Dan Kiley and the National Park Service envisioned preserving key landmarks, including the surviving Old Cathedral, and making them part of the Memorial. By the time that the city’s greatest modern landmark was completed, a legion of architects, businessmen and others were working to ensure more careful stewardship of the city’s architectural heritage. This entry was posted in Events, Mid-Century Modern. Bookmark the permalink.